notes, which informed me that Lucas (born 1993) was the elder by three years, I just couldn't be sure who was Lucas and who was Arthur. Their headshots weren't labeled. So, I stayed after the concert for the talkback with CSO artistic director Christopher Warren-Green, where the audience huddles up and fires questions at the maestro and this week's guests. It turns out that Warren-Green has some prior history with the Jussens in England, where he's performed with them before. Judging by the enthusiasm of the audience, during the concert and afterwards, I'd say the Jussens will be back, probably bringing us the Poulenc concerto for two pianos when they return. In the course of fielding questions, the Jussens sorted themselves out, saving me the trouble of asking out loud. Aside from learning about their schooling and practice regimens, including the logistics of apportioning practice time and rehearsing their two-piano repertoire - really, the CSO audience asks interesting questions - I found out that Lucas was the brother whom I had deemed to be the superior pianist. They faced one another with the lids of the pianos taken off, the better to see each other while playing, and the better for the orchestra's sound to reach us unimpeded. And indeed the interplay and coordination between the brothers proved to be exceptional from their first entrance into the Mozart, though Lucas executed the trills of the Allegro more brilliantly. It was good that Warren-Green had the CSO accompanying with such zest; there's still no falloff in their proficiency with Wolfgang years after the departure of Christof Perick from the podium. physiology and conditioning. In all of these things, Lucas and Arthur are more akin than any two concert or jazz pianists I've heard. Maybe that's why the dynamics and the tonalities match so well, for when Arthur takes over a phrase that Lucas starts, it sounds more like a continuation than an answer. 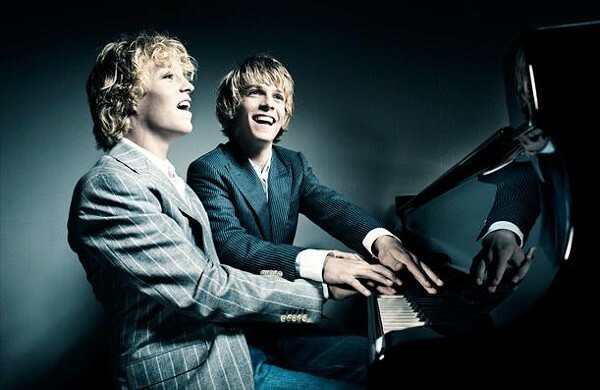 Like the Everly Brothers singing with identical Kentucky accents, there is something special and unique about the sound of the Jussen Brothers. Emboldened by the sensation they had created, the Jussens played multiple encores by Bizet and Berio. Warren-Green had no less reason for ebullience after the Mendelssohn, but before launching into the elder Strauss's Radetzky March - and hilariously fluffing it - he sounded out the audience on the idea of programming a waltz-filled, Viennese style gala in the near future. After a program of Merry Pranks, speedy Mendelssohn, and the Jussen Brothers, the crowd predictably clamored for anything Warren-Green might devise.